Do the garment and fringes need to be the same color? Some Poskim are of the opinion that the fringes and garment must be the same color. Thus, if the Tallis is red then the Tzitzis must also be red, and if the Tallis is green, then the Tzitzis must also be green. Others however hold that it is not necessary for the Tallis and fringes to match in color. 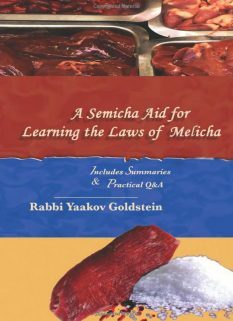 Practically, the final Halachic ruling follows this latter opinion, and so is the accepted custom in these provinces to tie white fringes to even colored Talleisim, and it is no longer customary at all to make colored strings. Nevertheless, it is proper for every meticulous individual to specifically wear a matching color Tallis and Tzitzis in order to fulfill ones obligation according to all opinions. Therefore, since we always make the strings white, one is to be particular to wear a white Tallis Katan. Which color is most appropriate? The custom is for the Tzitzis [fringes] to be white. Although from the letter of the law the Tallis [garment] may be made of any color [as explained above], nevertheless it is proper for every meticulous individual to specifically wear a white Tallis Katan and Gadol. Hence in total, both the fringes and the garment should be white. 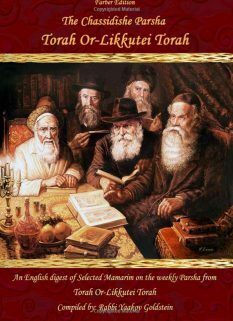 Those which desire to fulfill the Mitzvah of Tzitzis according to all opinions are to wear a pair of Tzitzis in which both the Tallis and its Tzitzis are of white material. Is there a problem to wear a colored Tallis Katan, such as the green IDF Tallis Katan distributed to soldiers? It is best not to wear a colored Tallis [Katan or Gadol] as there are opinions which rule that also the fringes must be of that color, as explained above, and today the color of all Tzitzis is white. This is in addition to the issues mentioned previously regarding wearing a Tallis made of cotton material. Why do we have black stripes on the Tallis Katan/Gadol? Some Poskim write that one is to have black stripes placed on the bottom of the Tallis in commemoration of the Techeiles, and so is the Ashkenazi custom. Other Poskim however write that one is to make the entire Tallis white without any black stripes and so is the Sefaradi custom. The width of the black stripes: There is an old Chabad custom that relates to the amount of thickness which the black stripes of the Tallis are to contain. 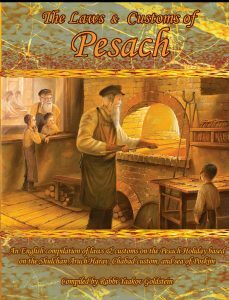 In the previous generation, the Talleisim manufactured by the Chassidim Rav Mordechai Chefetz of Riga and Rav Elchanon Marazov, followed this Chabad tradition. It is recalled of the Rebbe Rayatz that when he was in Eretz Yisrael he ordered a Tallis that follows this exact measurement followed in Lubavitch. 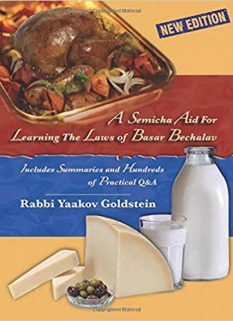 Over the years, this measurement of thickness was lost and there are few Chassidim that still have the original Talleisim made by the above manufacturers. Covering the stripes: It is not necessary to hide the black stripes of the Tallis Gadol upon wearing it. One is to avoid doing so if it will cause the back of the Tallis to be less than 50 cm wide. Is an old Tallis that has changed color not to be worn initially due to its lack of white? A Tallis which has changed color due to sweat, laundering, or use, is still considered white. Nevertheless, it is proper to buy a new white Tallis in order to beautify the Mitzvah. Some however were particular to never change their Tallis Gadol, even if it changed color due to sweat or age. What is the law if dye or paint spilled on one’s Tallis and caused it to receive a stain? 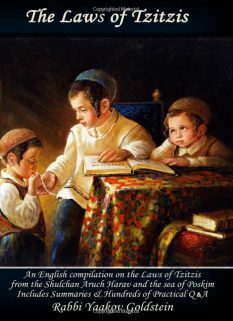 If a part of one’s Tallis or Tzitzis became stained, and it does not come off in the wash, it is nevertheless valid to be worn even initially, and fulfills the color requirements explained above. Nevertheless, if the Tallis no longer looks presentable, then it should be switched due to Zeh Keili Veanveihu. May one embroider verses onto a Tallis? No. 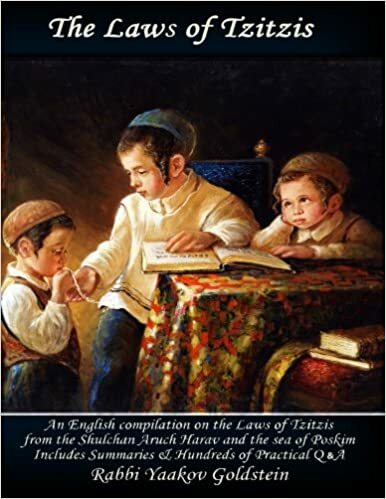 It is forbidden to embroider verses of the Torah onto a Tallis. Nevertheless, in the event that one did so, the Tallis may be worn so long as one treats it with the proper respect it now requires. 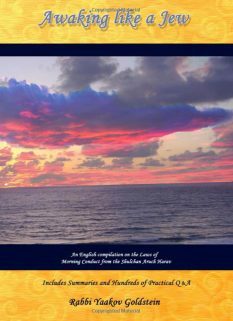 The reason: The reason they use specifically white fringes, is to emulate the color of the Tallis of Hashem, as explained in the coming footnotes. The reason: This is done to emulate the Techeiles and serve as a reminder of the Mitzvah. Doing so does not impair the validity of the Tzitzis in accordance to those that rule that the Tzitzis and garment must be the same color, as majority of the garment is in truth white. Correspondence Harav Yaakov Landa with Rebbe, brought in Shemuos Vesippurim 1/353. The Rebbe asked Rav Landa as to whether there is any truth in this custom and if it should be followed. Rav Landa answered as brought above. Rav Eliyahu Landa Shlita; Regarding why the Rebbe was seen to do so, Rav Eliyahu Landa explains that this was so the Tallis does not slip. So is told of the Taz that when he was approached with a new Tallis he refused to wear it, claiming that his Tallis contains the sweat of all of his prayers, and hence he did not want to switch it. Ginas Veradim 1/25-28; Shesilei Zeizim, 10; Shaareiy Teshuvah ibid; For example one may not sit on the area where the verses are written. One may not enter with it into a bathroom.